Very, very nice first car! Must have one BIG FUN ride. It was fun and got a whopping 4 mpg on the highway. I always loved those cars. There was a cousin car for sale a little while ago. Here is what its for sale picture was. My first car was a 1960 Corvette. Bought it for 1900.00 dollars in 72 between high school and college. Drove till I got out of college and need something more dependable. Way far from stock. Had 283 with 12.5 to one compression and double pumper with 411 rear. Silver with silver blue coves. 1976, Red with Saddle Brown Corvette Stingray, fresh out of the USMA. First car that I titled was a 1967 VW Bug. Loved it. But first car I drove regularly was 72 Ford LTD four door in high school. Loved that V8. Well, my first car was a '59 Karmann Ghia Vert....... bought it (1969) from a friend of my Dad's for $100 a month before I turned 16. sold it 6 months later for $325. Then ( 1969 ) bought the shop teacher's hopped up '66 VW bug that was quick....... had it 2 years until it swallowed a valve and blew up the engine. It would be till '75 that i bought my first Vette, a '65 Roadster...... sure would like that one back again. This was the first of 11 Vettes since. That is an excitingly amazing run Strake. 11 Corvettes!!! 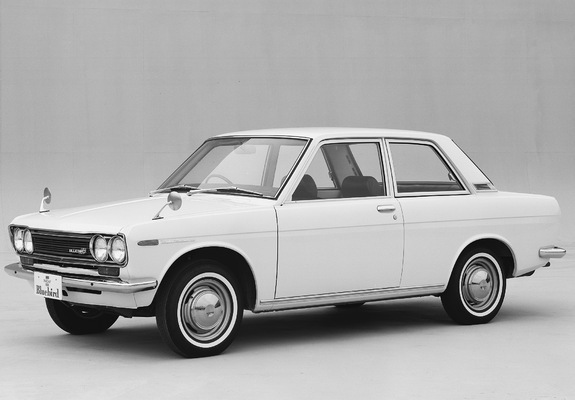 The first car I owned in my own name was a 1973 Datsun 510. A poor man's BMW, with IRS. And lots of aftermarket mods available. Yep! Almost exactly, even to the luggage rack, except my bumpers guards were black. But that ways it! Put over 100,000 miles in a year and a half and never had a problem out of it. Not one. Great car! Traded it in for a Mahogany, '78. Loved that car but took almost a year to get the rear end straight on the car. Turn left loud pop in the rear end . Turn right no noise. GM fixed at no cost to me, just a lot of downtime. Turned out the rear end was over engineered. They finally figured out by removing one spring out of the differential clutches solved the problem. Last edited by Leshelt; 09-28-2018, 01:24 AM. Sorry about that Leshelt. A friend with a 1976 had a similar experience with his ‘76, but his was getting his air conditioning to work. Yet similar to yours, with too much downtime, it was fixed totally under warranty, and worked well after months of frustration. My first owned car was a new Renault 5. Seemed cool at the time. 1972. Followed by a Triumph 2.5 PI (petrol injection). Also used by police as a highway patrol car in the UK. My first interesting car after emigrating to Canada was a quite rare 1971 Trans Am 455 HO. I rebuilt the engine a couple of times and ended selling it for a ridiculously low amount in the early '80's.